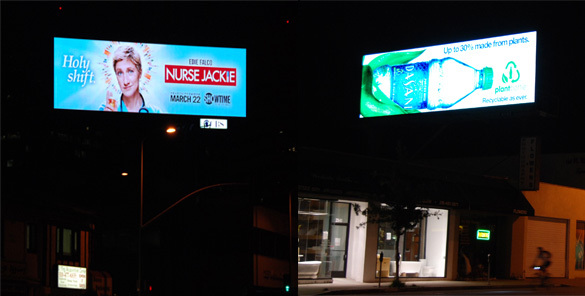 Two of five digital billboards on a 9-block section of Westwood Blvd. The two signs are directly across the street from residential buildings and the area planning commission ruled that they violate local zoning regulations. The reality, reported in these pages and elsewhere, is that a judge ruled almost three years ago that the city violated the public’s rights in allowing those billboards to go up without any notification, hearings, or conformance with local zoning regulations. The reality is that an Appeals Court will soon rule on the question of upholding the judge’s ruling and voiding the permits issued for those signs. The owners of of those signs, Clear Channel and CBS Outdoor, have lobbied city officials to come up with a binding legal agreement that would–in theory, at least–save those signs by rendering any ruling by the Appeals Court moot. As a sweetener, the companies have offered to take down an unspecified number of existing static billboards, and to share some of the considerable revenue those signs generate. For this scheme to work, however, that agreement would have to be signed into law before the Appeals Court issues its ruling, expected sometime later this year or early next year. If not, the court could void the billboard permits and the city would ostensibly have no choice but to order those billboards returned to their original, static configurations. In other words, for the billboard companies and their allies on the City Council, the clock is definitely ticking, since the smart money by legal observers is on the court upholding the lower court judge. How much courage is required to initiate something pushed for months by highly-paid billboard company lobbyists is open to question. Or perhaps Wesson meant that Krekorian and Reyes were courageously acting in the face of long-standing community complaints about digital billboards creating blight by allowing light trespass into homes and apartments, creating potential traffic hazards, and generally altering the character of neighborhoods. In any event, the motion did call for setting up a working group to develop the aforementioned binding legal agreements, which the casual observer might consider a call for dialogue on the issue of the offending billboards. And indeed, both Reyes and Krekorian used much of their time on the floor to talk about such a dialogue, and how it would not only be perfectly transparent but include a variety of interested and affected parties. However, the idea of a people sitting around a table in a public forum throwing ideas back and forth fell by the wayside when Krekorian said he was amending the motion to drop the “working group” and substitute a directive to city staff to complete the task of drafting legislation and legal agreements. Some councilmembers, most notably Bernard Parks, wanted neighborhood councils to be involved in the so-called dialogue, and even said he would vote against the Krekorian/Reyes motion if it only include “notification” to the neighborhood groups of the drafts prepared by city staff. Krekorian and Reyes repeatedly insisted that city staff would conduct outreach and gather input from all affected parties, and Parks voted for the motion even though in its official form it calls for “notification to all the city’s neighborhood Councils of any legislation or agreements proposed by staff.” In other words, an opportunity for input only after the proposed agreements are drawn up. But the biggest fiction to emerge from the council session was that nothing being proposed was intended to short circuit the appeals court decision expected sometime late this year or early next year. Letters filed with the court in that case, Summit Media vs. City of Los Angeles, make abundantly clear that Clear Channel has been pursuing an agreement with the city for more than a year and that the centerpiece of any agreement would be the legalization of the 100 existing digital billboards and the rendering of any decision by the Appeals Court moot. Councilman Tony Cardenas accused the press and some members of the public of making false claims that the proposal was intended as an end run around the courts. “Nothing could be further from the truth,” he said. Krekorian also insisted that that the proposal would have no direct impact on litigation, saying that the intention was simply to present a set of policy options to the city council. One might ask, then, why the motion appears to have been placed on an unusually fast track to final consideration by the council if it has nothing to do with the upcoming Appeals Court ruling. The motion was filed just five days before the council meeting, and waived by the committee that would normally hold a public hearing on it. And the motion calls for the city Planning Department and office of the Chief Legislative Analyst to provide “draft legislation and draft binding agreements that would address digital sign issues and extinguish the City’s potential liabilities in relation to the settlement agreements” within 30 days. This obfuscation is especially troubling given the city’s history vis-a-vis digital billboards. Almost before the ink had dried on the 2006 deal that allowed Clear Channel and CBS Outdoor to put up 840 of the signs, many community leaders were crying foul, saying that the city violated its own laws by taking the action without any public notification and hearings before the requisite boards and commissions. The Coalition to Ban Billboard Blight even hired an attorney to challenge the deal in Superior Court, although a judge ultimately ruled that the group lacked standing because it couldn’t prove that it’s members were harmed. When Summit Media filed suit against the city making many of the same claims, those same coalition members and community leaders believed that they would get their day in court, so to speak, and when a judge ruled in 2009 that the deal indeed violated public process and called it “poison” those persons felt some vindication from statements by some councilmembers and others that they were just noisy malcontents. And now, on the brink of an Appeals Court ruling in the case, those same persons are eagerly awaiting a final resolution that could be rendered meaningless by the City Council if it acts before the court does. Another troubling but not especially suprising element in the Tuesday Council meeting was the pitting by some councilmembers of one area of the city against the other. In an animated floor speech, Councilman Richard Alarcon used the term “held hostage” three times to describe what he believed the city’s Westside, which is home to most of the digital billboards, was imposing upon his own district in the San Fernando Valley, where he said there are residents and businesses who want digital billboards. Voting against the motion were Councilmembers Paul Koretz, Tom LaBonge, and Eric Garcetti. Councilman Bill Rosendahl was not in attendance, but sent a letter opposing the motion and expressing his support for letting the Appeals Court rule before discussing any billboard swap and revenue sharing. Those four councilman represent districts that have all but a handful of the digital billboards in the city. Those districts also have 26% of the city’s population, according to the 2010 census, which makes Alarcon’s math a little suspect. They are also among the city’s most affluent, which not only explains why they were attractive to billboard companies, but why council members like Alarcon might feel slighted by attention to their constituents’ concerns.